If you have cats, chances are you already have a carrier of some sort. If not, there are many choices – traditional carriers like that pictured above, soft-sided carriers, carriers that can be opened from the top, etc., etc. Homemade carrier from items you have at home. Some people transport their cats in an old cardboard box, a pillow case, or a laundry basket. These types of carriers are not safe for moving your cat around. 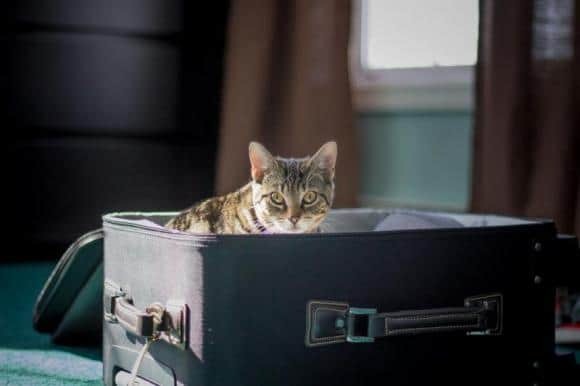 Cats can easily escape or become injured if you are transporting them in items that are not specifically designed to be cat travel carriers. Cardboard carrier. You will typically find this type of carrier at cat adoption facilities. 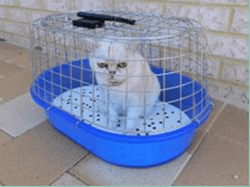 They are often given to clients for transporting a newly-adopted cat home. While they are mostly acceptable for this limited, short-term use, cardboard boxes are not recommended as your regular, permanent carrier. Soft-sided carrier. These types of carriers are usually made of nylon and are lightweight and easy to carry. Hard-sided carrier. This type of carrier is usually made of plastic, and they are very sturdy and durable. They are easy to clean and should have a steel mesh door. Don’t forget to take a look at the rest of the June 2018 V.E.T. News!